Bells, Grand, Peacock and Rusty fall into a book, but not just any book, the Book of Dead Pages AKA Mad Tome. Within Mad Tome reside all the pages that people didn’t finish reading and all the characters who are tired of continuously playing out those pages over and over again. Bells and her friends discover a world of books that have ulterior motives. Are these Badling children here by accident or were they lured into this imaginative world for another purpose? But hey, since books aren’t ‘real’ and Mad Tome is just a collection of pages torn out of other books they should be able to escape easily, right? After hopping through quite a number of stories and meeting quite a number of characters Bells and her buddies will discover that it’s not as easy to escape after all. Books, Rude Children, Badlings, Goodlings, Morbid Thoughts, Imagination, Doughnuts, Alice in Wonderland, Snow Queen, A Little Prince, Bluebeard, Masque of the Red Death, Sinbad, flying mattresses, Jungle Book, Don Quixote, Dracula, The Little Black Hen. Rusty and I both like doughnuts. Bells and I both don’t how to pick our fights as we choose to battle every time. Grand and I both ramble on when people don’t necessarily want to listen anymore. Sometimes I just want to be noticed, like Peacock. Ksenia Anske builds characters that may be completely different from her readers, but they always have something you can hold onto as a characteristic you can relate to. Which is good, because sometimes her storylines become entirely peculiar. Anske is a bit like Louis Sachar in that her characters are young and whiny and whimsical. Anske is a bit like Neil Gaiman in that she crafts a story that has creative rhyme and reason to the imaginative twists. Anske is a bit like Lewis Carroll in that the reader can’t quite tell what is real and what is false. 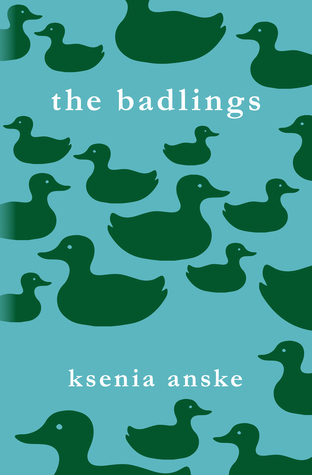 In The Badlings, Ksenia Anske gives me some of what I longed for in the Eyre Affair by Jasper Fforde. The Badlings is young adult and references books I’ve actually read, unlike Eyre Affair with its snooty books for adults. The Badlings began with a neat little twist, like a less sinister (or so I thought) Jumanji that was all about books! Four kids find an object (a book) and it does something completely out of the ordinary (pulls them in). From there Anske does things a little bit differently. I appreciated the fact that there is a subtle theme for holding books sacred and that you shouldn’t just throw them here or there and that you MUST FINISH THEM or be regarded as a Badling. Everybody should strive to be a Goodling. I recommend this book for anyone who enjoys the whimsical imagination of Neil Gaiman or appreciates books. This novel was published by Ksenia Anske July 7th, 2015 and is available on Ksenia Anske’s Website here.